I've received a couple emails and in-person questions lately about the affordability of the meat we eat, so I quickly want to touch on it as the opportunity has presented itself. We can't always afford the highest quality meat, however we do as much as we can to ensure we get the lowest toxicity meats we can. For us, that means that while our red meats (mostly bison and beef) are almost always Grass Fed, our chicken is generally not (unless I find a phenomenal deal). Reasoning being, the majority of the toxins in meats are in the fat. We avoid most of the toxins by buying boneless/skinless chicken breasts and adding good fats to the meal to supplement what we are missing out by buying conventional. Right now Tropical Traditions is having a great deal on one of our favorite ways to do this, Coconut Oil. 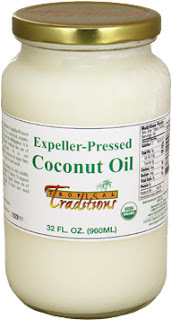 The have their Expeller Pressed Coconut Oil (odorless and flavorless, so perfect for savory cooking) on sale Buy 1 Get 1 Free. Additionally, when you use Coupon Code 11126 you get free shipping! Because these are high quality, glass jar packaged, coconut oils they can be very expensive to buy and have shipped. By stocking up when they have a great deal like this I am able to feed my family well, and still stay within budget!